I saw the movie Coraline and really enjoyed the characters and story, so I headed to Amazon and got this book for my Kindle. I didn’t realize it was actually a novelization of a television series. I liked the writing style, and the story flowed quickly and kept my interest that’s for sure. Some of it was almost poetry. So the day became one of waiting, which was, he knew, a sin: moments were to be experienced; waiting was a sin against both the time that was still to come and the moments one was currently disregarding. Still, he was waiting. I stuck the series in my Netflix queue; I want to see the visual depiction even though reports are the production quality isn’t the greatest. I am also going to have to get the rest of his body of work. I’ll probably try on Stardust next. 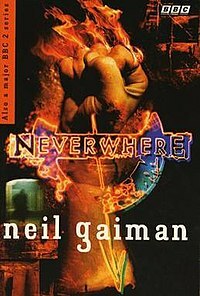 This entry was posted in 2011 Reading List, Fantasy and tagged Books, Neil Gaiman, Neverwhere. Bookmark the permalink.